An Energy Action Plan (EAP) is a strategic planning document that lays out the City’s goals and possible actions to reduce energy consumption by increasing energy efficiency and procuring more renewable energy. 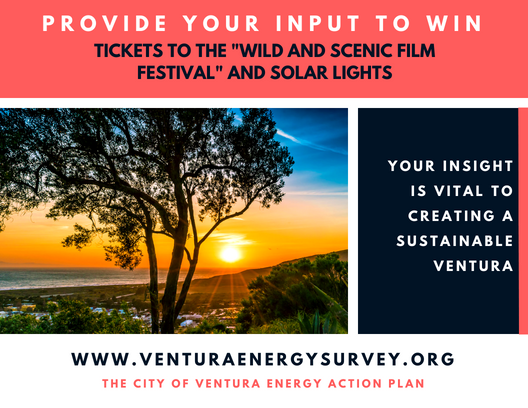 City of Ventura Environmental Specialist Brandon Kaysen explains how the City is requesting Ventura residents to take the Energy Action Plan Survey - a quick survey to help determine goals to reduce energy consumption. Almost 20% of the waste going to landfill from Ventura residents is made up of food waste, half of which is inedible (things like avocado skins, corn husks). 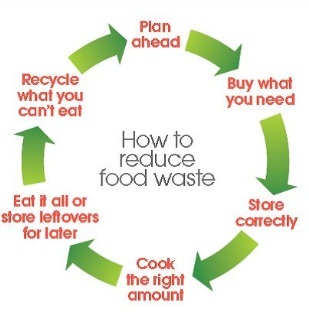 So for the 10% that’s preventable, the City of Ventura has gathered together some important information and tools to help you curb your food waste. City of Ventura Environmental Specialist Arriana Rabago is here to share some tips on how to save the food. Lower Your Utility Bills with the emPower Program! emPower program helps homeowners make affordable utility upgrades to their home offering a variety of incentives, financing, qualified contractors, and expert energy advice. City of Ventura Environmental Specialist Brandon Kaysen talks to Sustainable Ventura about the program. Get your ticket to the 21st Annual Poinsettia Awards Luncheon 2017 on December 7, 2017. Visit VenturaChamber.com or the Ventura Chamber website. As part of the City of Ventura’s Public Works department, the Environmental Sustainability Division’s mission is to assist in protecting and preserving the sustainability of our beautiful city in order to ensure the environmental, social and economic viability of Ventura for future generations. 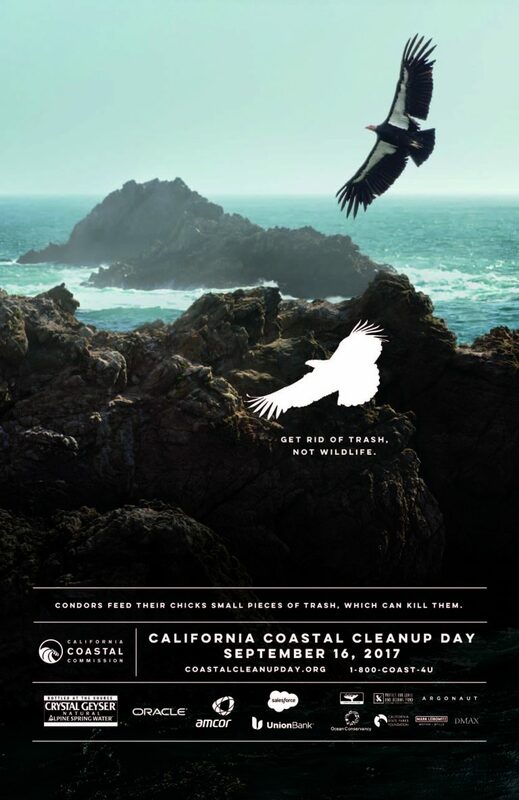 The 33rd Annual California Coastal Cleanup Day is Saturday, September 16, 9:00 AM to Noon. The event is looking for volunteers to help pick up trash on beaches and near waterways to protect California wildlife as well as conserve the health and beauty of our environment. City of Ventura Environmental Specialist Arriana Rabago shares information. 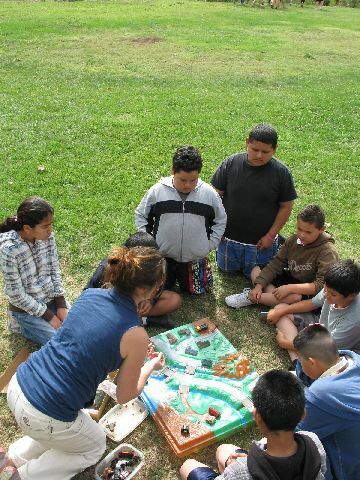 The City of Ventura Environmental Sustainability Division and Ventura Water offer free educational presentations to all local K-12 schools, after-school and pre-school programs. 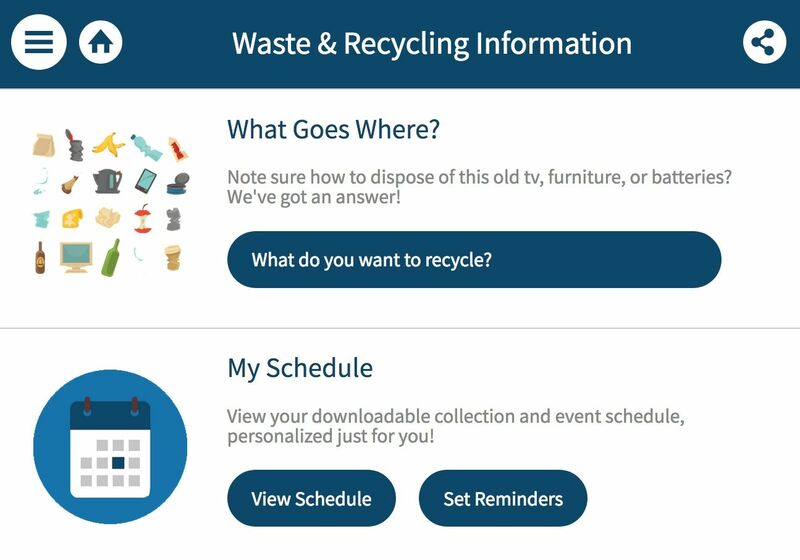 These interactive educational programs teach students about natural resources, solid waste management, recycling, waste reduction strategies, and water conservation. All presentations are tailored to specific grade levels and standards-based. In this PODCACAST, City of Ventura Environmental Specialist Brandon Kaysen talks about the programs for 2017. 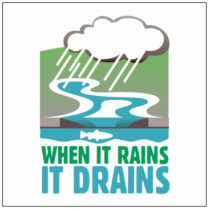 Help keep stormwater clean this winter, and consider planting more native plants; these are plants that have adapted to the local geography, and climate of the area. They tend to need less care, require little or no irrigation or fertilizer, are resistant to local pests and disease, and provide habitat for native wildlife species. 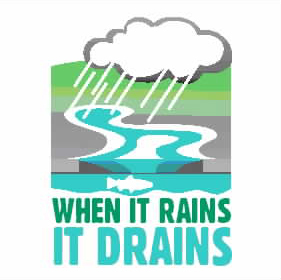 In this Sustainable Ventura PODCAST, City of Ventura Environmental Services Supervisor Todd Hunsdorfer shares some great TIPS on how you can be proactive in reducing storm drain and stormwater pollution! This past July 2016, Ventura City Council granted a 10-year franchise renewal agreement to EJ Harrison & Sons, Inc., for the collection, sweeping, diversion, and disposal of solid waste, and collection and transport for processing of organic waste and recyclable materials. To date, EJ Harrison & Sons, in conjunction with Gold Coast Recycling and Agromin, in partnership with the City of Ventura, have helped the city achieve a solid waste landfill diversion rate of over 70%. In this Sustainable Ventura News PODCAST, City of Ventura Environmental Specialist Tobie Mitchell talks about some of the new enhanced services that apply to existing residential, commercial and City Services. City of Ventura residents, Get Your FREE Sustainability Kit - The City of Ventura Environmental Sustainability Division in partnership with the Ventura Water Department are offering Sustainability Kits to city residents to help increase recycling and assist residents with conserving energy, water, natural resources, and even save some money. The kit includes either a tote to carry recyclables to the bin outside, or a 10 gallon kitchen recycling bin, a reusable shopping bag, reusable produce bag, water bottle, BPA free plastic drinking cup (for Ventura tap water! ), a refillable homemade cleaner bottle with recipes, grease can lid, dish scraper, compact fluorescent light bulb, a hose nozzle, and water saving devices for the home. In this segment of Sustainable Ventura News, host Maryann Ridini Spencer talks with City of Ventura Environmental Specialist Tobie Mitchell. Get Your Sustainability Kits, click here! Become a City of Ventura Green Certified Business in 2016! Becoming a GREEN Business is SMART Business. In this Sustainable Ventura News POCAST Host Maryann Ridini Spencer speaks with City of Ventura Environmental Specialist Lars Davenport about "How to become a City of Ventura Green Certified Business." For more information on becoming Green Certified, visit: SustainableVentura.TV and SEARCH "Green Certified Business" and "Green Business." Everyone loves a clean house, but not everyone loves the process of cleaning a house! Household cleaning products often contain harsh chemicals that can potentially irritate our skin, burn our eyes, or contribute to long-term health consequences. In this Sustainable Ventura News PODCAST City of Ventura Environmental Specialist Tobie Mitchell shares some important tips to clean your home in a healthy, safe, and environmentally-friendly way. DIY Green Cleaning Ideas, Click Here. You're Invited to take the City of Ventura's FOOD WASTE PREVENTION CHALLENGE! 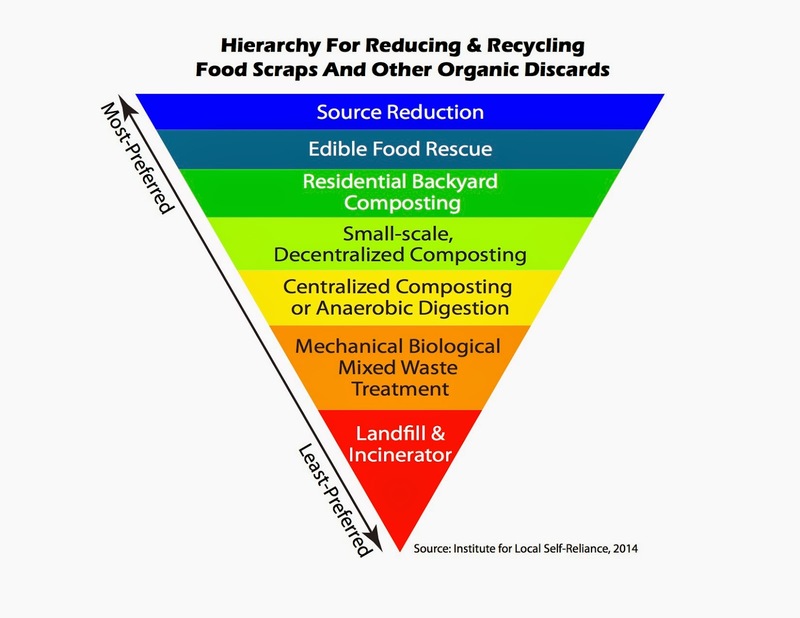 In this Sustainable Ventura News PODCAST, City of Ventura Environmental Specialists Courtney Lindberg and Tobie Mitchell talk to show host, Maryann Ridini Spencer, about the City of Ventura's Food Waste Preventional Challenge taking place from May 18-July, 12, 2015. Whether it's sour milk, mushy bananas, moldy bread, or soggy restaurant leftovers, chances are we have all wasted some food this week. You're not alone. The sad truth is 40% of all food in the United States goes uneaten. Meanwhile, 1 in 6 Americans lack a secure supply of food to their tables. You're invited to join the City of Ventura on an 8-week challenge to DO SOMETHING about wasted food. All residents are welcome to particiipate. We will provide you with the tools you need to be successful. You just need to bring your enthusiasm and commitment! During the Challenge, we'll measure how much food waste your household throws away, then give you strategies to shop smarter, prep and store food more efficiently, and get creative with cooking. Love Food, Hate Food Waste, Save Our Water, and Other Helpful Green Tips! According to a recent article in the Washington Post, Americans throw away nearly $170 billion dollars of food every year. That's an astounding figure when nearly 50 million Americans live with the reality of food insecurity. Why is this happening? What can be done about it? How does food waste impact our water supply? Greenhouse gas emissions? In this Sustainable Ventura Podcst, City of Ventura Environmental Specialist Jill Santos talks to Sustainable Ventura's Maryann Ridini Spencer who helps shed some light on this critical issue. Jill also shares helpful green tips and green living ideas. UPCOMING EVENT: On Friday, April 24 from 6-9pm at Ventura's Bell Arts Factory, 432 Ventura Avenue, Environmentalist Rob Greenfield will screen his documentary focusing on how to prevent food waste and other green topics. When you turn on a light, work at the computer, watch television, or blend up your favorite fruit smoothie, you may not think about the fact that all these tasks require energy. The production and flow of energy to your home and work place requires complex infrastructure that requires ongoing maintenance. Over time, this upkeep of energy systems and operations translates into cost increases on your energy bill. Moving forward, how can you possibly ensure your electricity costs will stay the same or even decrease over time? There’s a simple, affordable solution. On April 17, 2014, underneath the solar panels at Patagonia’s downtown Ventura headquarters, Community Environmental Council’s (CEC) in partnership with the City of Ventura announced the new “Solarize Ventura” program. The program, which educates and assists residents with residential solar installations, is based on a successful model used in other communities across the country. A typical residential solar system can range from $7,000 to $20,000 per home and take approximately 4-8 weeks to install. When purchasing a system, homeowners can often re-coop their investment within 5-7 years. Additionally, solar panels have a lifespan of approximately 25-30 years, and thus become an added value to any property. If a homeowner is reluctant to purchase a system, lease programs are available for no money down. With either method, homeowners will likely see immediate energy savings. Several FREE Solarize Ventura workshops have been held during June to enthusiastic resident response.The program will run through July 2014. Interested residents should sign up on or before the end of July to take advantage of this program. Once signed up by the end of July, you will be able to book an installation date within the following 12 month period. Homeowners interested in going solar should contact Jefferson Litton at (805) 963-0583 or register at www.solarizeventura.org. On Thursday, October 24, 2013, SustainableVentura.TV went on location to the "Haunting at the Harbor Business Tabletop Expo" presented by the Ventura Chamber of Commerce. The event, held from 4:30pm to 7:30pm at the Four Point Sheraton Ventura Harbor Resort, featured 59 exhibitors, food vendors, raffle prizzes and three hours of fun, networking and mingling. The City of Ventura Environmental Sustainability and Ventura Water both had booths at the event and were promoting a number of green and sustainable practices. On Saturday, October 12, 2013, from 10am-11:30am, Ventura Water, Aqua-flo and Green Thumb Nursery presented the second in a series of six Water Wise classes. The topic for the day was “How to employ Ocean Friendly Garden principles of CPR- Conservation, Permeability and Retention." Ocean Friendly Gardens is a trademark of Surfrider Foundation and OFGs, as they’re also known, are beautiful, easy-to-maintain, and serve as vehicles to assist in the prevention of stormwater pollution. Laura Bauer, BauerFineGardening.com, gave a talk and presented an informative slide show that took the audience through the concepts of an Ocean Friendly Garden, how it works, as well some examples of beautiful native plants. SustainableVentura.TV spoke to some of the attendees who took the class. 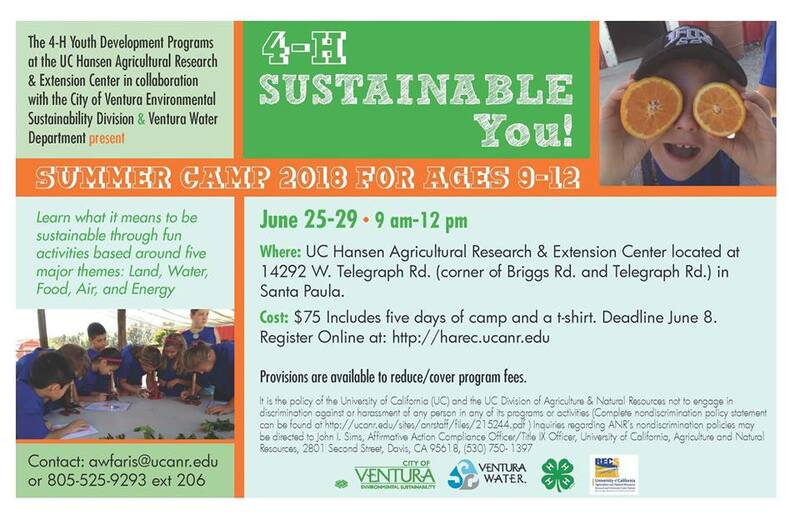 For more information on Green Events, visit: SustainableVentura.TV. On August 14, 2013, Ventura Chamber of Commerce's Green Task Force and Friends of the Channel Coast State Parks presented a FREE Green Drinks Event from 5-7:00pm at San Buenaventura State Beach. Sustainable Ventura's Maryann Ridini Spencer talked to attendees. SustainableVentura.TV attends the Ventura Green Task Force's Green Drinks Event on May 8, 2013 at Connect Ventura, (50 West Main Street, Ventura). Green Drinks, well known in international environmental circles, and hosted in approximately 600 cities worldwide, is a network of unstructured meet-ups where environmental professionals from a variety of industries and concerned locals get together in a relaxed settings to network and discuss sustainable topics, exchange ideas, forge valuable relationships and of course, partake in appetizers and drinks. Show host Maryann Ridini Spencer talks to professionals that attended the event. In this "Sustainable Ventura" podcast host Maryann Ridini Spencer talks with Ray Olson, Manager, City of Ventura's Environmental Sustainability Divsion about preventing stormwater pollution. Ray offers some great tips on how individuals can make a difference in keeping our environment safe and clean by taking some simple steps. The February 2013 “Sustainable Ventura” TV series features “Beautiful Lessons” music video featuring valuable reduce, reuse and recycling messages and the music of Holly Overin (Hollyosongs@yahoo.com) and Charell Charley. Environmental Sustainability’s Ray Olson also appears with Marian Macumber. Katherine Kasmir plays the CEO. In the City of Ventura, California, part of being a smart business means incorporating environmentally friendly practices that take care of your company's bottom line and that help preserve the environment. In this podcast, Sustainable Ventura host Maryann Ridini Spencer talks with City of Ventura Environmental Specialist Courtney Lindberg about how business can become certified. It's a FREE process to Ventura-based businesses. Contact Courtney by email: clindberg@cityofventura.net or call (805) 667-6502. Also CLICK HERE to WATCH THE VIDEO to find out more about becoming a Certified Green Business on the January 2013 "Sustainable Ventura" show. The October 2012 "Sustainable Ventura" TV series features this "Sunflower People" music video featuring valuable reduce, reuse and recycling messages and the music of Holly Overin and Charell Charley. Environmental Sustainability's Ray Olson also appears with Marian Macumber. Also on the show this month, Sustainable Ventura talks with Steve Dodge and Josh Ball, the owners of Endless Sustainability, about Aquaponic Gardens, how they work and why they are so great for the environment. Additional segments on the show this month feature interviews with Gary Kohler, Director of Sales and Marketing for Crowne Plaza Ventura Beach and Jim Rice, President and Executive Director of Bell Arts Factory about their sustainable and eco-friendly practices. "Sustainable Ventura" hosted by Maryann Ridini Spencer and Ray Olson, airs on Caps-TV VTV's Channel 15, Thursdays at 8:30pm. It rebroadcasts Monday-Thursday and Saturdays at 9:00am, Sundays at 8:30pm and every other Wednesday at 8:30pm. CAPS-TV presented Ray Olson, Manager, City of Ventura’s Environmental Sustainability Division with a 2012 Cappie Award, at the recent awards ceremony for TV movie, “The Treasure of San Buenaventura.” Ray produced the project which takes viewers back to the old west in 1880′s Ventura. The project touches upon important environmental issues and programs encouraging the citizens of the time to start recycling, water conservation and stormwater protection programs paving the way for a more sustainable future. In this podcast, Sustainable Ventura host, Maryann Ridini Spencer, talks to Ray about the project. To find out more, Visit: sustainableventura.wordpress.com and "search" "Treasure of San Buenaventura." Green School Awards - Get your application in TODAY! 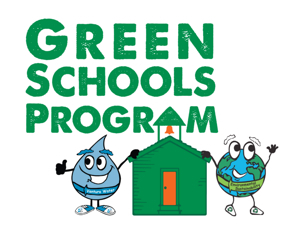 If you are a school located within the City of Ventura, Ca, get your submission in for a GREEN SCHOOL AWARD before October 8, 2012. In this podcast, Environmental Specialist Christine Wied talks to "Sustainable Ventura" about the Green School Award and how to apply. Does your school have a great recycling program? 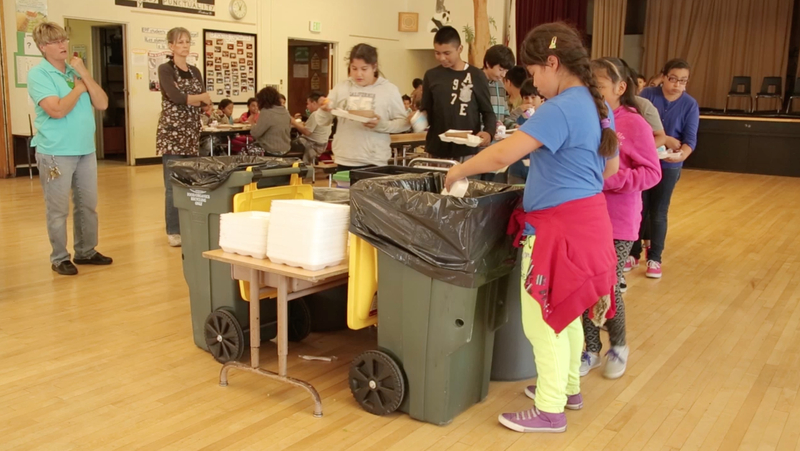 Does your school strive for zero-waste lunches? Does your school try to conserve water and energy? Does your school have a compost or worm bin to support a garden project? Then we encourage your school to apply for the 2012 GREEN SCHOOL AWARD! This award sponsored by the City of Ventura Environmental Sustainability Division in partnership with Agromin Premium Soil Products recognizes schools that show exemplary efforts in caring for our environment. Applications are due by Monday, October 8, 2012. For more information, contact Christine Wied at (805) 652-4584 or cwied@ci.ventura.ca.us. READ MORE & GET THE APPLICATION, CLICK HERE. On June 7, 2012, The Ventura Chamber of Commerce held the semi-Annual Tabletop Business Expo "Olympics by the Ocean" at the Four Points Sheraton (1050 Schooner Drive in Ventura) from 4:30-7:30pm. On hand were 59 local Exhibitors including the City's Environmental Sustainability Division and Ventura Water. The City was also one of the event sponsors. Sustainable Ventura's Maryann Ridini Spencer spoke to some of the attendees about their green and eco-friendly business practices. Earth Day, April 22: Be a Part of it! Buying local fresh fruits and vegetables, whenever possible, is a great way to support the local economy. Purchasing produce when it's "in season" is also the best way to enjoy the nutritious benefits. Attending Certified Farmer's Markets are a great way to take advantage of the best produce, baked goods, and beautiful flowers and plants that come direct from the farm to your table. Listen to this podcast where host Maryann Ridini Spencer shares some shopping tips. 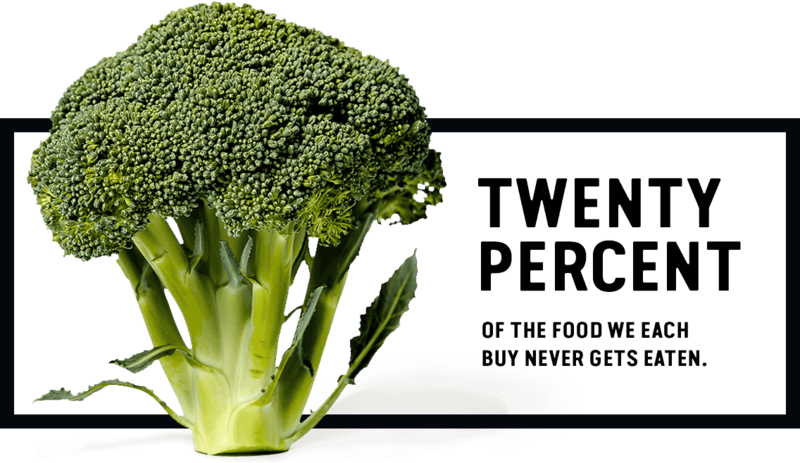 For more information, visit: SustainbleVentura.wordpress.com and SEARCH "Farmer's Markets." "Sustainable Ventura," an Environmental Sustainability Production, is hosted by Maryann Ridini Spencer and Ray Olson and seen on CAPS-TV's VTV, Channel 15 on Thursdays at 8:30pm and rebroadcasts weekly. For more show schedule information, visit: http://www.Capstv.org (program listings for Channel 15).